Gukak. February. 21, 2007 07:10. raphy@donga.com. 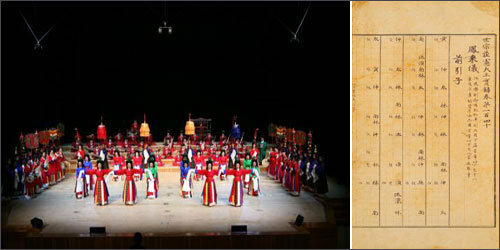 Bongraeui  Come, Phoenix to be performed at the Yeakdang of the National Center for Korean Traditional Performing Arts attempts to revive old music played at the time of King Sejong the Great, 500 years ago. Yongbieocheonga (Songs of Flying Dragons through the Heavens) written in 1445, Sejong 27, is a long epic eulogizing the founding of the Joseon Dynasty and written in Hunminjeongeum (the Korean alphabet created by King Sejong). The second chapter, printed beside King Sejong on the newly issued 10,000-won note, is a literary masterpiece showcasing the beauty of Hangeul. Bongraeui is also a court jeongjae (songs and dance used at a court play) with a unique form composed of Chihwapyeong and Chwipunghyeong, dancing and singing to Yongbieocheonga in Hyangak style, and Yeominrak in Dangak style with lyrics translated into Chinese. Its harmony between Hangeul and Chinese letters, Hyangak and Dangak, proclaims the underlying spirit of the Joseon Dynasty. For this reason, Bongraeui was performed whenever there was a crisis. King Kojong ordered it to be performed when he renamed Joseon as Taehan Jeguk. With the music at the time of King Sejong lost, however, it has been performed in the costumes of the later period of Joseon with the scores used at the time of King Kojong. Bongraeui is scheduled to be performed at 7:30 p.m., Feb. 23 and at 5:00 p.m., Feb. 24. Tickets are 10,000 to 30,000 won. For any inquiries, call 02-580-3333.